Details : nice winter pullover with a V-neck and long sleeves. 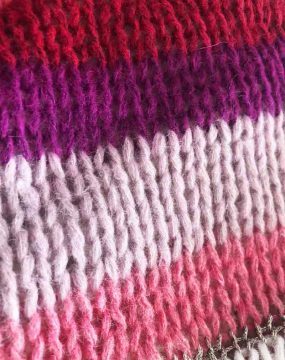 4 big stripes in off white pink grey and blue. Wash instructions: wash below or at 30°C ,with iron dry clean,do not tumble dry. Style : wear this cozy pullover with jeans and sneakers or boots, if it gets colder you can add a scarf! Details: beautiful floral pattern, V-neckline, two long crocheted decorative ribbons with tassels and decorated with small sequins. Style: Just a dark denim jeans, whether skinny or boyfriend look, cool boots and a faux fur vest. Furthermore you can enhance your look additionally with big tassels earrings. Style: style the cardigan Stella with a black top and blue denim or black denim. For a day outfit wear sneakers. For an after work outfit pair it up with black highheels… This style will be lovely for Christmas time. It brings some sparkle to your wardrobe! Style: Wear the cardigan over a white blouse with jeans and sneakers. The color lilac is totally hip this fall. Washing instructions: Hand wash, please do not bleach, do not tumble dry, iron from the inside at low temperature, dry clean recommended. Style: Wear this Paige skirt to it, or a dark blue denim jeans. In addition big tassel earrings and boots. When its getting colder combine a wild leather jacket. Style: wear it with sneakers for a cool city look! Or wear it with white long denim and converse sneakers. Blouse Carolin is one of our favorit blouse this Summer. It’s absolute stunning. Style: Wear it in Summer with sandals during the day. For the night simply add some open high Hehls….for holder days just wear a Jeans Jacket on top.